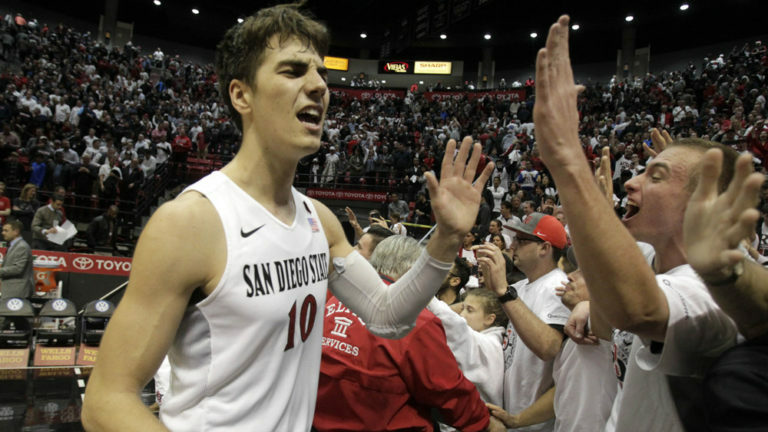 One member of the team that led the Aztecs to the NCAA Tournament for the first time in three years won’t be coming back next season. Redshirt junior Max Montana will forgo his last year of eligibility to go pro, San Diego State men’s basketball coach Brian Dutcher announced Tuesday. Montana is on pace to graduate this summer. The 6-fo0t-9 forward played in 26 of the Aztecs’ 33 games this season and missing two games because of a knee injury. Montana has dual US and Germany citizenship through his father, making him a valuable commodity because he could play in the European leagues without a work visa. This season, Montana averaged 6.9 points and three bounds and made 41 3-pointers with a 36.3-percent completion rate — the second highest on the team. Montana was the second from the Mountain West Championship team to go pro. Red-shirt freshman Jalen McDaniels declared his eligibility for the 2018 NBA draft last month. McDaniels though has not hired an agent, thus preserving his eligibility if he withdraws before June.